What Can Protect Me Against Asbestos? Here at Asbesto Waste Solutions, we’re always happy to share our industry knowledge with our customers, keeping them up to date with the correct safety procedures when it comes to asbestos and its removal in the construction industry. 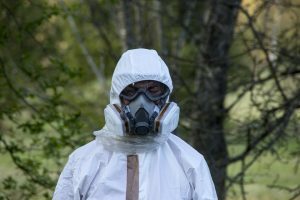 This month, we want to talk about safety equipment – specifically masks – detailing what you should and shouldn’t use if you think you might be in close proximity to asbestos. FFP1 dust masks protect against low levels of dust, as well as solid and liquid aerosols. These dust masks are suitable for hand sanding, drilling, and cutting. FFP2 dust masks protect against moderate levels of dust, as well as solid and liquid aerosols. These masks are ideal for plastering and sanding. FFP3 dust masks protect against higher levels of dust. They also protect against solid and liquid aerosols. FFP3 masks are suitable for handling hazardous powders, such as those found in the pharmaceutical industry. Standard dust masks, that is, any disposable dust mask which falls under the FFP1 or FFP2 category, will not provide sufficient protection against asbestos fibers if they have been released. Despite this, many people – be they homeowners or professionals – still use dust masks with insufficient protection when encountering asbestos. Consequently, if exposed to fibers, this failure to prepare properly could ultimately prove fatal. 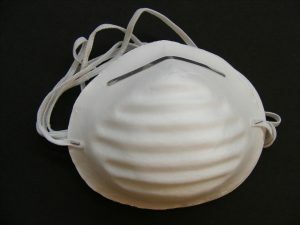 So, in order to handle asbestos safely, you need a class FFP3 mask. These masks offer high levels of protection against fine dust, complete with a secure face seal to ensure that no fibers can enter. 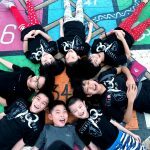 FFP3 masks can be both disposable and reusable and can have a number of different features, but if you opt for a reusable mask, it must be cleaned properly. Asbestos Waste Solutions are committed to providing safe, efficient and reliable asbestos disposal for domestic and commercial customers throughout the UK. Our fully qualified team work with complete professional care at all times, and are on hand to provide any advice you need to make sure that the asbestos in your property is handled and disposed of correctly. For more information about all of our services, don’t hesitate to get in touch with us today.